128 C A R M E L M A G A Z I N E • H O L I D A Y 2 0 1 5 DANNY DEVITO AND RHEA PERLMAN "This was for a People magazine story. Because I had relationships with Robin Williams, Billy Crystal, Whoopi Goldberg and others, I was kind of the go-to guy around the office for comedians. "We were just goofing around, at their home in Hollywood Hills, playing pool. I said, 'Rhea you should throw Danny on the table and give him the biggest wet kiss'…and she did. It's one of those spontaneous moments that get someone to reveal their personality." JOHN LENNON AND YOKO ONO " I'd photographed John a few times in New York for the Daily Express. 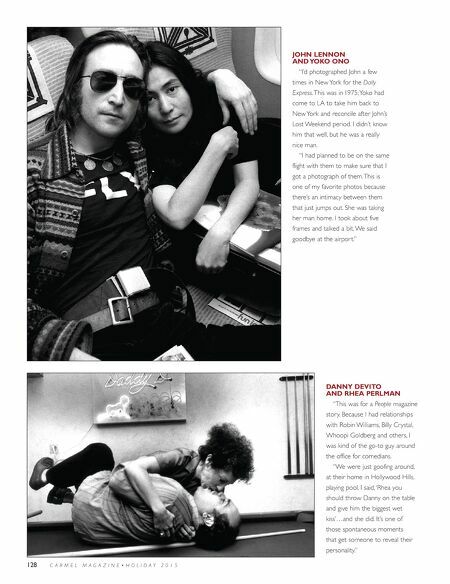 This was in 1975; Yoko had come to LA to take him back to New York and reconcile after John's Lost Weekend period. I didn't know him that well, but he was a really nice man. 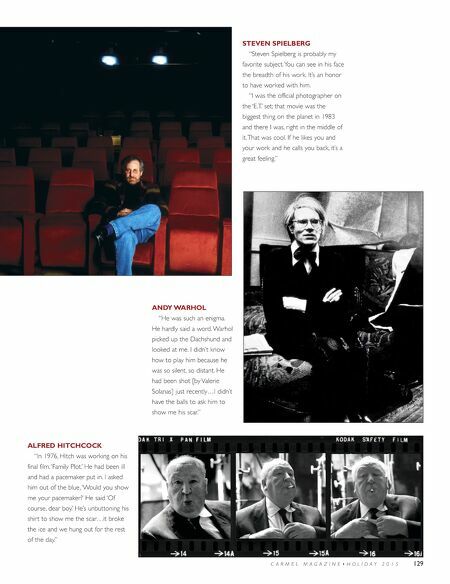 "I had planned to be on the same flight with them to make sure that I got a photograph of them. This is one of my favorite photos because there's an intimacy between them that just jumps out. She was taking her man home. I took about five frames and talked a bit. We said goodbye at the airport."